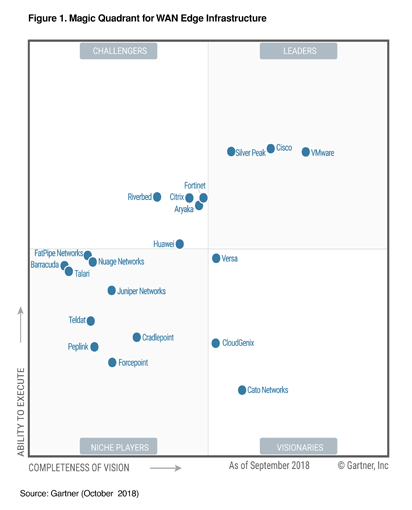 Gartner Magic Quadrant for SD-WAN Edge - Silver Peak a Leader! With more than 1,000 enterprise customer deployments in production, see why we believe Silver Peak is recognized as a Leader and is revolutionizing the WAN market with its business-first networking model. WAN edge infrastructure now incorporates a widening set of network functions, including secure routers, firewalls, SD-WAN, WAN path control and WAN optimization, along with traditional routing functionality. This is Gartner's Magic Quadrant, which is a culmination of research in a specific market, giving you a wide-angle view of the relative positions of the market’s competitors. If you are rethinking your WAN edge (and we believe you should be), this report is a must-read. See why we believe thousands of forward-thinking businesses around the world rely on Silver Peak. This graphic was published by Gartner, Inc. as part of a larger research document and should be evaluated in the context of the entire document. The Gartner document is available upon request from Silver Peak Systems. Gartner does not endorse any vendor, product or service depicted in its research publications, and does not advise technology users to select only those vendors with the highest ratings or other designation. Gartner research publications consist of the opinions of Gartner’s research organization and should not be construed as statements of fact. Gartner disclaims all warranties, expressed or implied, with respect to this research, including any warranties of merchantability or fitness for a particular purpose. © 2019 Silver Peak Systems, Inc. | All Rights Reserved.